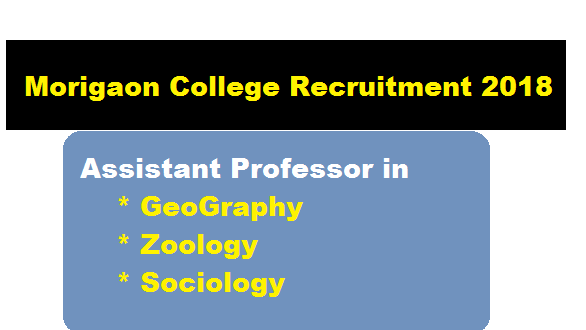 Morigaon College Recruitment 2018 – Assistant Professor : Good news for aspirants who are looking for Assistant professor Jobs in Colleges. Recently Morigaon College has issued a Recruitment Notification in the month of July 2018. According to the Latest Morigaon College Recruitment 2018 July, a walk-in interview will be held at Morigaon College on 20th July, 2018 from 10 a.m. onwards for the posts of Assistant Professors (Contractual) for different subjects. We have detailed info about this Morigaon College Jobs shared below. In this section, we will be mentioning details about the Recruitment of Assistant Professor Under Morigaon College Assam Recruitment 2018 with all the important requirement criteria to apply for the posts. Eligible and interested Candidates having UGC norms are notified to apply by E mail : morigaoncollege@hotmail.com by 19th July, 2018. Note : No separate call letter for interview will be issued. All biodata from HSLC to post graduate, research publications and teaching experience should be sent by E-mail. Candidates must bring all the original testimonials at the time of interview.